This delicious post was sponsored by Jones Dairy Farm and all opinions are my own as always. 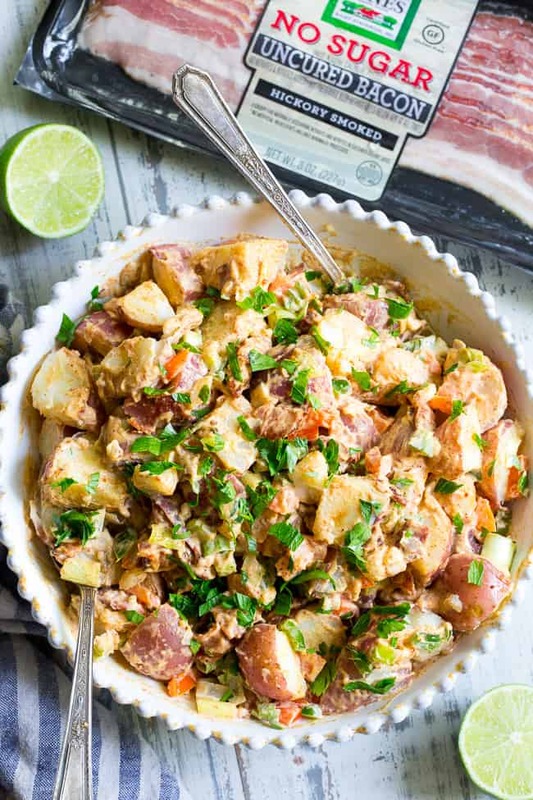 This spicy and savory chipotle lime potato salad with bacon is loaded with flavor! 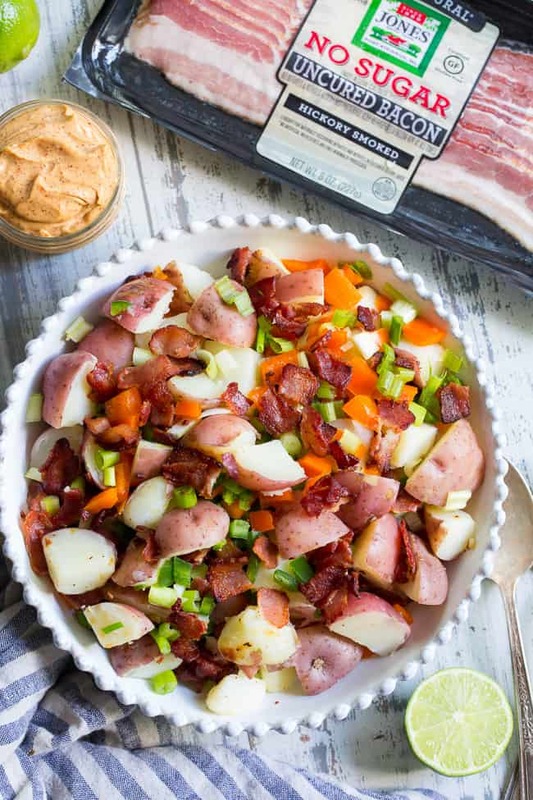 Jalapeno and bell peppers, crispy bacon, and green onions give it crunch and flavor and the creamy chipotle lime dressing makes this paleo and Whole30 potato salad next-level delicious! I have a few requirements for my perfect potato salad. First, the dressing needs to be over-the-top tasty. Really – you should want to eat the dressing all by itself, in my opinion, if the potato salad is going to be worth it. Trust me on this one – the dressing passed my test with flying colors! Second, I need bacon in my potato salad. This is no joke – if you search “potato salad” on this site, you’re not going to find one without bacon in it! The other flavors can vary (and oh, they do!) but one thing has to be consistent – bacon! I just can’t seem to do potato salad without it. To make my chipotle lime potato salad Whole30, I used sugar-free Whole30 compliant bacon from Jones Dairy Farm. Given how much I love (and need!) bacon, it’s no secret that when I find a good sugar-free Whole30 compliant bacon, it’s time to celebrate! For all of you Whole30’ers out there, I know you’re right there with me. Finding Whole30 friendly bacon and sausage just makes meals a whole lot more fun, tasty, and, well, exciting to sit down to! Jones Dairy Farm makes crispy, delicious uncured, sugar-free bacon that’s perfect for so many Whole30 recipes, (remember my bacon zucchini fritters?!) along with sugar-free pork sausage (used in my sausage leek & spinach quiche) and fully-cooked chicken, pork and turkey sausage to throw into quick meals. Okay, we can move on from the bacon for a second to my last requirement – the actual potatoes! When it comes to white potato salad (as opposed to sweet potato) I MUST use those small waxy red skinned potaotes. 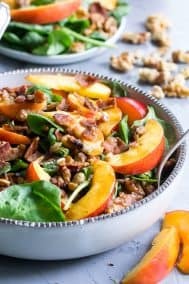 I think the texture and flavor are totally on point and blend so well with all the crunchy and creamy ingredients in the salad. Aside from those three requirements, I decided to add some spice to this potato salad with the chipotle lime dressing. It’s a mayo-based dressing, and one that I highly recommend using my homemade mayo for if you can for the best flavor. 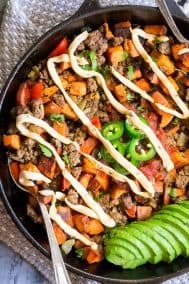 If homemade mayo just isn’t your thing, you can sub in a paleo avocado oil mayo such as the one from Primal Kitchen for a great Whole30 compliant base for the dressing. 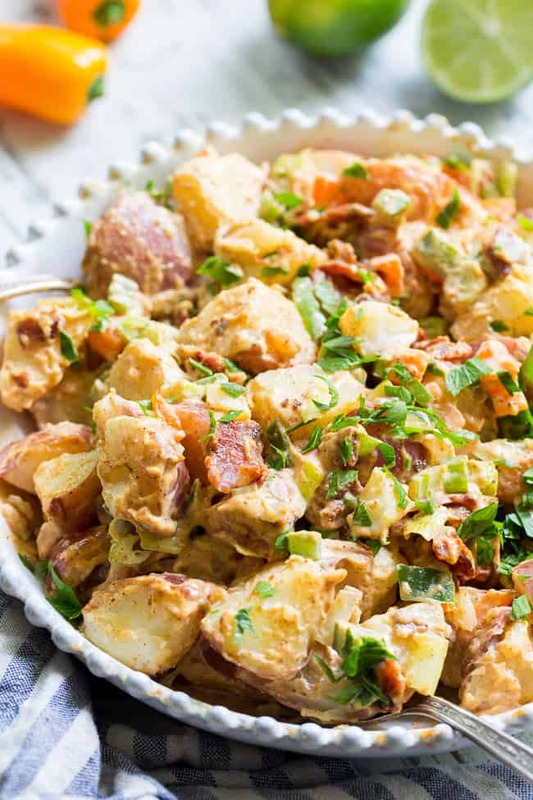 Aside from how incredibly tasty it is, this potato salad is also super simple to make! There isn’t much hands-on work at all, as the messiest part about it is cooking that bacon – which we will never DARE to complain about no matter what percentage of our wardrobes have been scarred with bacon grease. Always worth it, if you ask me. And now I believe it’s time to cook! 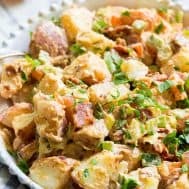 This Chipotle Lime Potato Salad with bacon is going to be a hit with your family and anyone else to gets the pleasure of taking a bite! I hope you’re ready to get the potatoes and bacon cooking now – let’s go! 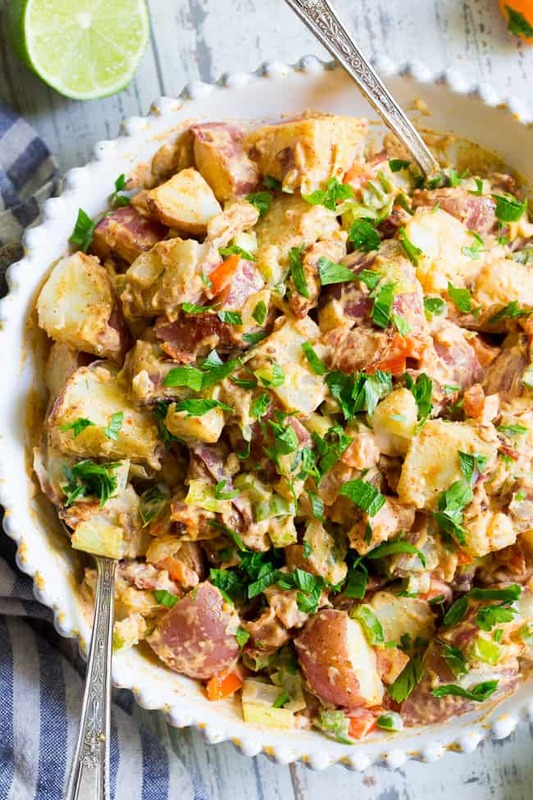 This spicy and savory chipotle lime potato salad is loaded with flavor! 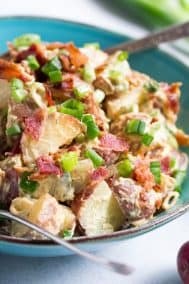 Crispy bacon, jalapeno and bell peppers and green onions give it crunch and flavor and the creamy chipotle lime dressing takes this paleo and Whole30 potato salad to the next level of delicious! 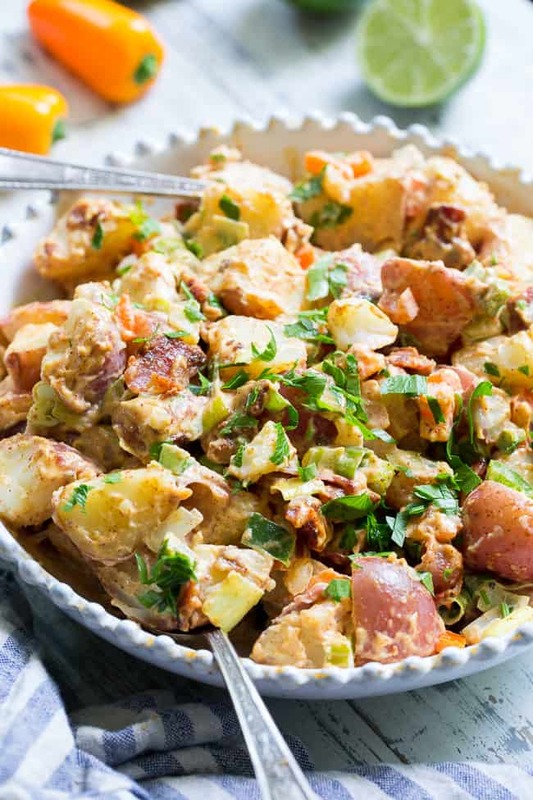 While the potatoes cool, prepare the dressing by whisking together all ingredients until well combined, then chill in the fridge until ready to use. In a large skillet, cook your bacon pieces, stirring to evenly brown, until crispy. Drain/cool on paper towels, crumble any larger pieces. Once potatoes are cooled, cut them into bite size pieces or quarters. Gently toss with the crumbled bacon, jalapeno pepper, bell pepper, and sliced scallions, then mix in the chipotle lime dressing. Garnish with cilantro if desired - enjoy! VISIT THE JONES DAIRY FARMS WEBSITE TO CHECK OUT THEIR ALL NATURAL, SUGAR FREE SAUSAGE, BACON, HAM AND MORE! I was thrilled to discover this recipe! I thought red potatoes were a no-no but O.M.G. 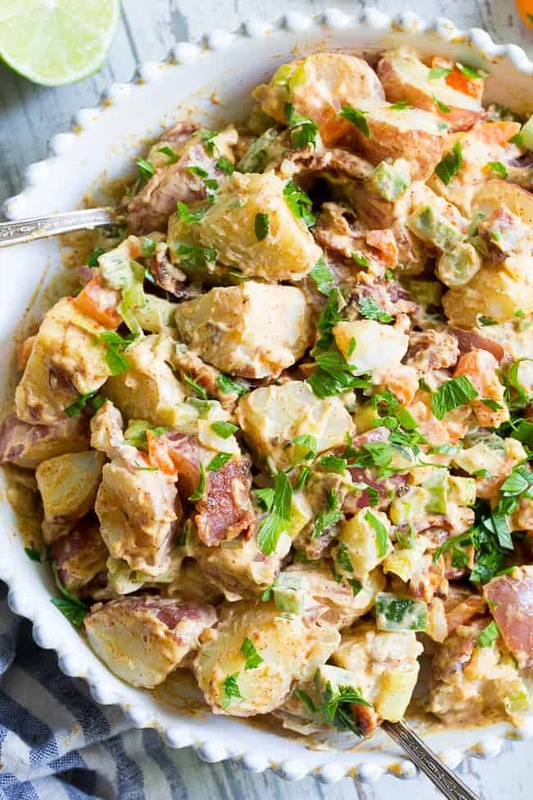 this potato salad ROCKS! I added chopped hard boiled eggs. YUM!!! That sounds delicious! I’m thrilled you enjoyed it! Would this be good with sweet potatoes? Do you eat this potatoe salad hot or cold?! Michele, ALL of your recipes are SO awesome! My husband and I did whole 30 in February and during that time and since then your website is our go-to place for everything AMAZING! Made this potato salad – OMG! So so tasty! I am so glad I found you. Keep up the great work! I have made this twice so far, and it is a definite winner! A friend of our son declared it to be the “best potato salad” he had ever had! It really is delicious and very easy to assemble. This is seriously so amazing!!! We have made it numerous times and my husband always asks me to make it again. I have even added shredded chicken to it which was so yummy as well! It is hard not to eat it all in 1 sitting!